Digital elevation map created with AMIE data. Scientists have created a 3-Dpicture of a luminous and mountainous site on the moon that holds promise as apossible future location for a lunar colony. The spot, near the moon's southpole, is called the "peak of eternal light" because it isalmost continuously exposed to sunlight. Researchers created the new 3-D image using data taken bythe Advanced Moon Micro-Imager Experiment (AMIE) camera carried by the EuropeanSpace Agency's SMART-1(Small Missions for Advanced Research in Technology) robotic moon mission. "AMIE is not a stereo camera, so producing a 3-D modelof the surface has been a challenge," said ESA researcher Detlef Koschny. "We?ve used a techniquewhere we use the brightness of reflected light to determine the slope and, bycomparing several images, put together a model that produces a shadow patternthat matches those observed by SMART-1." Koschny plans to present the images Sept. 26 at the EuropeanPlanetary Science Congress in M?nster, Germany. During its orbits around the moon, which lasted from November 2004 until September 2006, AMIEtook a total of 113 images of the peak, located close to the rim of theShackleton Crater on the lunar south pole. In all but four of the images, thepeak was illuminated by sunlight. The peak of eternal light could bea promising spot for a future manned moon landing or even a lunarcolony, because the near-continuous sunlight that shines down couldgenerate a constant electricity supply. In addition, the shadowed cratersnearby are in perpetual darkness and may hold water ice deposited overmillennia by impacting comets and hydrogen and oxygen particles contained inthe solar wind. To create the 3-D map of the area,the team, led by Bj?rn Grieger of ESA?s European Space Astronomy Centre inMadrid, analyzed five images taken from different angles. 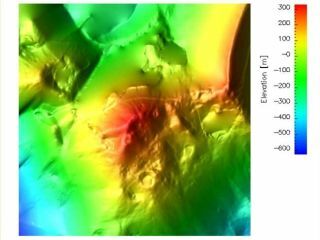 By comparing theimages, and mapping all of their pixels onto a grid, the researchers calculatedthe angles of the peak's slopes and produced a topographical model. After its years in orbit, theSMART-1 satellite eventually crashedinto the moon as planned in September 2006.